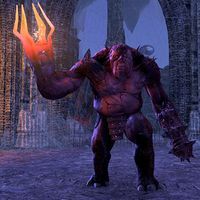 Gwarchodwyr is a flesh atronach in the service of Mephala found in The Spiral Skein. The atronach guards the path to where Meridia's Golden Knight is being held captive by Zikal-zun and must be killed in order to burn away the webbing that's stops you from just running past. This page was last modified on 22 June 2018, at 15:07.